Are a budtender or a vendor selling Utopia Sparkling Water? Or are you interested in carrying the product? Read on to find about more about Utopia. Unlike any cannabis infused beverage on the market today! to love the zero calories, zero sugar, and zero weed taste that Utopia has to offer. Zero sugar and calories in Utopia, means it’s perfect for the avid cannabis consumer who’s sick of the sugar-laden drinks saturating the market right now. Help your customers learn more about Utopia Sparkling Water. WHAT DOES UTOPIA TASTE LIKE? It tastes like mountain-fresh water from Washington state with hints of natural fruit flavoring—just like that one soda water with a cult following—except with the added fun of cannabis. All of that, without the taste of cannabis or sugar. NO WEED TASTE OR SMELL? Seriously, Utopia tastes like crisp sparkling water. We created water-soluble emulsion to eradicate traces of cannabis in beverages. Because there’s no cannabis taste or smell, we don’t have to add high-fructose and other sugars to cover it up. We have a bias but we know customers are going to love the zero calories, zero sugar, and zero weed taste that Utopia has to offer. We keep saying Utopia is the beverage of the gods, but they’ll be bowing down to you after they try Utopia Sparkling Water. Zero calories, zero sugar, and zero weed taste—just bubbly water infused with cannabis and all-natural flavors from the Pacific Northwest. Zero sugar and calories in Utopia, means it’s perfect for the avid cannabis consumer who’s sick of the sugar-laden drinks saturating the market right now. How Can I Order Some? Contact our sales team and they will have your shelves stocked in no time. 10 MG is for the newcomers and the microdosers. Remember, you can always drink more, but you can’t drink less. 30 MG is the equivalent of three servings, so save some for later - or maybe for your friends. 50 MG is the equivalent of five servings, so this dose is for those with a higher tolerance. 100 MG might be for you if you need a lot of cannabis to feel its effects. It is also perfect for sharing. A premier maker of cannabis products. 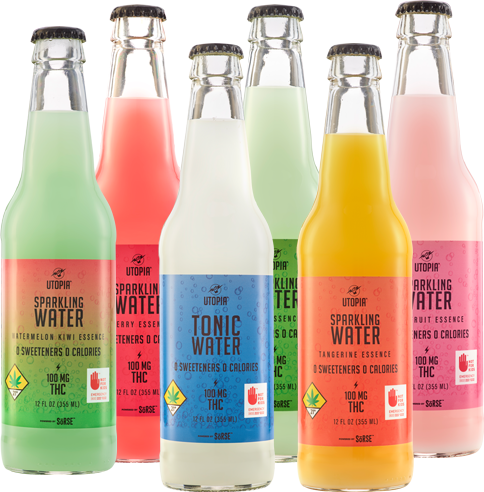 Interested in carrying Utopia Sparkling Water in your store?